Arabians, Thoroughbreds, Saddlebreds, and Quarter Horses have led the Hartland parade of breeds prized by horse lovers for four decades. 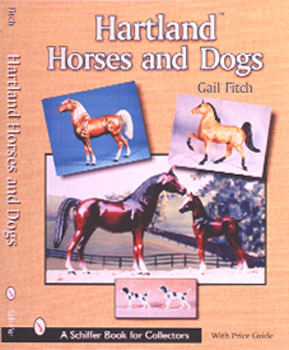 Capturing grace, power, spirit, and refinement in plastic, Hartland horses and dogs portray the majesty of the equine and canine worlds with detailed conformation and breathtaking colors. The quality of the 1960s sculpture by Roger Williams and Alvar Bckstrand and fine attention to painted details are evident in all sizes of Hartland dogs, horse families, and individual horses. Hartland Plastics (1939-1978) was a small, midwestern company that set a standard of excellence for mass-produced models. Hartland expert Gail Fitch has assembled this guide complete with 739 color photos and valuable information for the collector, including current prices and advice on care and repair of your models.